Whisk your Valentine away to Sydney’s first-ever harbour-side Lovers’ Dinner being staged in the heart of the Royal Botanic Garden Sydney. Enjoy a three-course dinner and open bar as you drink in the world-famous view from this exclusive, private location set to be Sydney’s most romantic Valentine’s event. 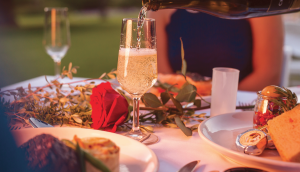 Dine under the stars at a candle-lit table for two, enjoying live music and a menu prepared by the Botanic Garden Restaurant. Dinner sales are available for purchase until 5pm on the 16th February. © 2019 Ticketbooth on behalf of Phoenix Entertainment Live. All sales are final. Tickets are non-refundable.